Chief Strategist Steve Bannon's dismissal from the White House last week removes one of the most hawkish voices on China within the Trump Administration. But his departure won't lead to major reversals in Donald Trump's now increasingly tough foreign policy stance towards Beijing. On the contrary, the proliferation of China sceptics across the Administration means that the US is likely to continue pursuing a harder line towards China on trade and security. Bannon was undoubtedly the White House's lead proponent of a strategy to contain Chinese power. He viewed Beijing as an 'expansionist' and 'arrogant' competitor that would, in the next decade or so, pose an existential threat to American interests in Asia. Conflict with China, in his view, was already on the cards. In an interview before his firing last week, Bannon declared that the US was 'at economic war with China', and that Beijing would win this hegemonic contest by the 2040s unless Washington became 'maniacally focused' on trade and investment competition. He has predicted a US-China war in the South China Sea within a decade and lobbied for a more robust US military posture in the Western Pacific, including the strengthening America's Asian alliances. Although Bannon's fatalistic views about China were more extreme than most of his colleagues', the difference was one of degree rather than general orientation. The fact is, many Administration officials (and the President himself) want the US to implement tougher economic and strategic policies towards China. 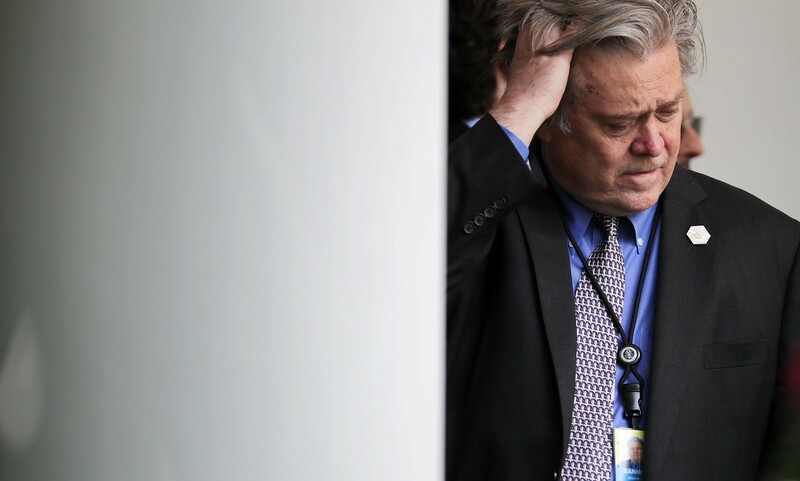 Their resolve is not likely to weaken anytime soon and it is quite independent of the influence Bannon has had on Trump's thinking. Take trade hawks Robert Lighthizer, Dennis Shea, and Peter Navarro, for example (respectively America's top two trade representatives and the head of Trump's new National Trade Council). All have indicated that they will push for aggressive trade measures to reduce America's deficit with China and, to this end, will adopt a maximalist interpretation of World Trade Organization trade enforcement rules. At Lighthizer's request, the Administration has already begun to explore stricter terms on Chinese state-led investment into the US by launching a Section 301 investigation into China's intellectual property theft last week. Import tariffs on allegedly 'unfair' Chinese steel and aluminium exports are also being considered. It's true that this won't amount to a wholeheartedly mercantilist US-China trade agenda. Opposition from Jared Kushner, Gary Cohen, and other 'globalists' in the Administration will temper the more extreme impulses of an 'America first' approach to trade. But in this respect not much has changed with Bannon's departure. Bannon was under no illusions that his most strident views (such as the logic of a trade war with China) would be fully carried out. He did, however, hope that by bringing China trade hawks into the Administration and energising his populist Breitbart base, the Trump presidency would chart a more muscular course in the US-China economic relationship. With tariffs looming and scepticism building over Chinese investment, the White House's trade enforcement agenda towards Beijing is likely to continue. On security policy, too, Bannon's ouster won't stop the Administration from ratcheting up pressure on China. While Trump's top national security advisers are not China hawks in an ideological sense, officials like Secretary of Defense James Mattis, National Security Adviser HR McMaster, and Matt Pottinger of the National Security Council are deeply troubled by Beijing's efforts to overturn Asia's post-war regional security order. All see China's maritime coercion, expanding military patrols, and geopolitical influence operations across the Indo-Pacific as a push by Beijing to build a tributary sphere of influence, and a challenge to US interests of the highest order. Mattis, McMaster, and Pottinger (alongside many others in the US national security bureaucracy) are thus resolved to strengthen America's strategic presence in Indo-Pacific Asia. This has already included an increase in forward-deployed forces, military patrols, and sensitive reconnaissance operations, and an effort to bolster the defence fundamentals of America's Asian alliances and partnerships. If Beijing expects the Trump Administration to go soft on China following Bannon's dismissal, it's going to be very disappointed. None of this is to say the Administration has developed a consistent China policy or Asia strategy yet. It hasn't. Bannon's effort to prioritise strategic competition with China over everything else in Asia (including curbing North Korea's nuclear ambitions) was neither implemented nor particularly well-thought through. In fact, it seems clear that his departure will see McMaster and Secretary of State Rex Tillerson get their way on a North Korea-China linkage strategy, lumping more pressure on China and holding out the prospect of a deal if Beijing does more to halt Pyongyang's missile program – which some Asia watchers think is an ultimately futile exercise and a distraction from focusing on the main game of pushing-back against Chinese assertiveness. But the absence of a comprehensive strategy won't stop the momentum that has recently built up around an increasingly hardline US China policy. In the past two months, the Trump Administration has stepped up its freedom of navigation patrols in the South China Sea, approved new arms sales to Taiwan, imposed two rounds of secondary sanctions on Chinese entities in breach of North Korean trade restrictions, shamed China as one of the world's worst human trafficking offenders, reinvigorated the China-balancing logic of alliances with the Philippines and Thailand, and drummed up support for a major inquiry into Chinese intellectual property theft. Bannon may not have accomplished most of his populist goals, but he is likely to be pleased with this track record and will undoubtedly use his soapbox at Breitbart to keep prodding President Trump in this direction.